It's great to start 2018 on a high as we have just been awarded the Best Play of 2017 by the Salford Star, details at the link. I'm going to come back to that statement shortly. As a lot of you will know I've been enjoying creating a series of plays and films known as Tales from Paradise Heights, a series I'll be returning to very soon, but I wanted a little sabbatical. I wanted to write something removed from today's dangerously real world of Paradise Heights, even though there has been a flavour of the supernatural about those Tales, with ghosts and angels appearing in the series. But I wanted to go a little further. Why the hell not? I write in the witching hours, the wee small hours, the hours between midnight and four in the morning, I've always written my best stuff during those hours. In those hours you naturally think 'ghosts...' or I do, I'm not kidding, some nights I totally freak myself out - have to put Abba on so I don't feel as scared. Scary. Not just a ghost story though. I wanted it to be a period piece, something that would fit the world of M R James, Edgar Allan Poe or H P Lovecraft. At the same time tipping the hat to the Hammer Horror Classics that I watched in my youth, and how many of these classics tapped into England’s cultural history of haunted castles, demons and witchcraft? 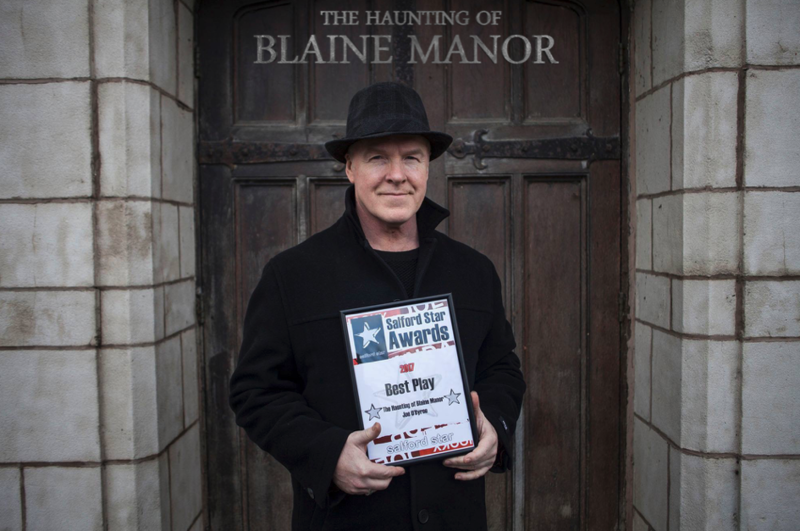 Blaine Manor has something of the Borley Rectory about it. In tandem with this I also wanted to create something that was a throwback to the Hollywood Golden Age, where glamour mixed with danger like bourbon poured over rocks, where you would see the likes of Claude Rains, Vincent Price, Sydney Greenstreet, Peter Lorre, Boris Karloff, Bette Davis, Humphrey Bogart, Robert Mitchum, Lauren Bacall, Ida Lupino and Virginia Mayo (so many more, but I'd be here forever) strutting their stuff. I think they'd all feel at home in Blaine Manor. There is fear here, yes, my original sound designer left due to having nightmares based around the production - true story! The play delivers, we already know that from its first sold out run. So. Have you ever felt like you were being watched? A member of the audience of the plays first outing (did I mention it was sold out?) said that they felt like there was something watching them whilst the play was unfolding, they felt something dark and disturbing in the theatre. They felt a little embarrassed telling me but I took that as a compliment. The atmosphere generated from our haunted manor certainly projected that feeling, there is a tangible fear that moves from the characters to the audience as things spiral out of control in the story, all helped by the fantastic portrayals of the cast. Any play is only as good as its cast, and we gathered a fabulous set of reviews from the first run due to the casts dedication and skill bringing these characters to life. The show is blessed with the stellar talents of Jo Haydock, Peter Slater, Andrew Yates, Dan Thackeray, myself and this time Studio Salford Best Actor Award Winner Phil Dennison joins the cast taking over from the brilliant Ian Curley. On top of that - or underscoring it - is a fabulous sound design by Justin Wetherill. I didn't want stock library sound effects for this production. I wanted to create a disturbing sound design from scritchety scratch. As previously stated my original sound designer, who I had worked with before (I love building totally original sound scores for plays) left the production very early on. This was due to being disturbed by the script, the story was literally too scary for them to work on, elements of the story staying with them and causing nightmares. Whilst the fact that I had written something so disturbing was reassuring, losing my brilliant sound designer wasn't. I put an ad out and Justin got in touch. We worked together over a period of months, online. I typed down ideas, trying to verbalise ideas and sounds, and Justin tried to figure out what the hell I was on about. Pretty soon we got on the same groove - I'm not going to share the alchemy of how we ended up recording the sounds you hear in the play, you can try and work that out. In addition I wanted an original theme, and applying the same process above Justin worked his magic and composed a brilliantly haunting opening and closing theme for the show. A dedicated professional and a lovely guy to work with, his work throughout is nothing short of superb. To compliment all of the above we are again blessed with the fabulous designs of Darren McGinn, producing the fabulous range of poster designs you see below, and there will be a new trailer to add to his fabulous trailer and poster creations of the past that litter this website. There is a page here dedicated to his work. Below you will also find a fabulous gallery from Shay Rowan - who again has blessed us with his work in the past, again illustrated throughout the site. This is all about collaboration and none of the works here would be what they are without the input of so many brilliantly gifted North West talents. Aldous Huxley tried the psychedelic hallucinogen, mescaline, inspiring his book The Doors of Perception. Four million workers went on strike in France to protest against austerity measures. Elvis Presley made his first ever recordings at Sun Records Memphis Recording Studios.